Can homeopathy treat gall bladder stones? The gall bladder is a sac under the liver that stores bile. Bile is produced by the liver. After meals, the gallbladder contracts and releases bile into the intestines, which helps in digestion. The bile is stored in the gallbladder and over a period of time, it becomes more concentrated, which makes it better at digesting fats. 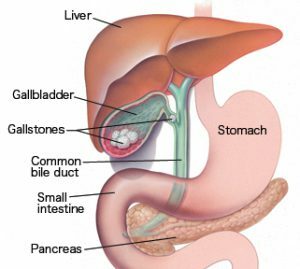 Gall bladder stones occur when one of the substances that are present in the bile (usually a waste product called bilirubin, or cholesterol) becomes too concentrated and forms a stone. Gall bladder needs to empty bile to be healthy and function properly. If it fails to empty its bile content, the bile becomes overly concentrated, which causes stones to form. Often gallstones do not cause any problems when they do not move. But sometimes they block the exit from the gallbladder, called the cystic duct causing spasms inflammation of the gallbladder, a condition known cholecystitis. Gallstones are common in females than males and with increasing age chances of gallstone formation are more. Cholesterol stones: This is the most common type of gallbladder stone. Around 80% patient suffering with gall stones known to have cholesterol stones. Pigment stones are made up of bilirubin, a component of bile. Recurrent liver infections or other liver conditions like cirrhosis. Diagnosis of Gallstones is primarily done with ultrasound of abdomen or CT scan. 1) Surgery: When gallstones are symptomatic and do not respond to conservative management, surgery is recommended in such cases for removal of gall bladder. Laproscopic surgery is very effective way to remove the gall bladder. Few surgical procedures are used only to remove gallstones without removing the gall bladder. 2) Medications like chenodiol (Chenix), ursodiol (Actigall), or both, are prescribed to dissolve cholesterol stones. These medicines are to be taken for years to completely dissolve the stones. 30+ years of expertise. 180+ countries like UK, USA, Australia, Canada, UAE & more served. Ask your question to Dr. Shah’s team directly & get an expert opinion on your ailment! Mostly the small sized gallstones can be treated with homeopathy in the initial stages of the disease. The symptoms accompanied in gall stones can be managed in the initial stage with homeopathic medicines. When homeopathic medicines administered appropriately the tendency of forming stones can be stopped with no side effects.The length of this treatment depends on the size and chemical composition of the stone and varies from case to case. Cases having large and multiple stones needs immediate surgery where homeopathy does not play any significant role. In cases where only stones are removed by surgical procedure, homeopathic medicines can be given after surgery to stop the tendency of stone formation. Dr. Rajesh Shah’s research based medicines have helped in patients with small-sized gallstones in the initial phase of the disease. To know more about how homeopathy will help in the treatment of gallstones, do get in touch with us by leaving your contact details below or writing to us at info@lifeforce.in or giving us a call at +91-2266888888.